Faculty, staff, and students at the University of Minnesota are working to internationalize student learning on all five campuses. From groundbreaking research to innovative programs, from culturally-sensitive pedagogy to truly interdisciplinary global thinking, their contributions make the University of Minnesota a leader in international education. The book Internationalizing Higher Education: Critical Collaborations across the Curriculum, edited by Rhiannon Williams and Amy Lee from the University of Minnesota, includes several chapters contributed by faculty and staff actively involved in Campus Internationalization at the University of Minnesota. Download a list of publications by other faculty involved in Internationalizing Teaching and Learning. The ambitious goal of Internationalizing the Curriculum and Campus is to provide global learning opportunities for all students. Learn more about how students are impacted by efforts to internationalize the curriculum and campus. Faculty and staff are transforming the student experience through internationalizing the curriculum and campus. The stories below are just a few examples of the inspiring work of dedicated faculty to internationalize their work. 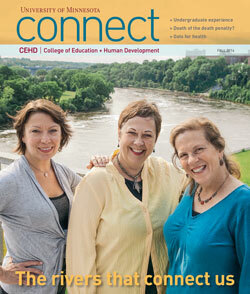 Internationalizing Teaching and Learning faculty Catherine Solheim and Linda Buturian, along with colleague Susan Andre, were featured in the College of Education and Human Development’s Connect magazine, discussing their work with communities along the Mekong and Mississippi rivers. Read the story here.